Connecticut periodontist Dr. Richard Amato now offers patients from Bridgeport, CT an alternative to conventional gum surgery in the form of the LANAP® protocol. This laser surgery is a minimally invasive gum disease treatment that offers patients minimal pain and a fast healing period, along with all of the health benefits of regular gum surgery. People who live in Bridgeport, CT and suffer from gum disease can now visit Dr. Richard Amato, a Connecticut periodontist, for a minimally invasive alternative to traditional gum surgery. With the LANAP® protocol, which is a laser gum surgery procedure, Dr. Amato can exclusively target periodontal disease without cutting or removing any healthy tissue. This advanced gum disease treatment reduces discomfort, bleeding, and healing time for patients while improving their oral and general health. Dr. Amato performs the LANAP® protocol using the PerioLase® MVP-7™, a laser that is transparent to healthy tissue. Only the bacteria responsible for gum disease absorb the laser, which allows Dr. Amato to operate with precision. He begins the gum disease treatment by measuring the patient’s gum pocket depths and then using the PerioLase® MVP-7™ to remove infected tissue and bacteria. After removing tartar deposits below the gum line with an ultrasonic tool, Dr. Amato uses the laser a second time. This time, the laser seals the gum pocket, closing it off from infection, and stimulates regeneration in the alveolar bone. The procedure causes few undesirable side effects, and many patients can resume normal activities the day after surgery. As a periodontist in Connecticut, Dr. Amato recommends the LANAP® protocol to patients because of its long term health benefits. The procedure reduces the risk of tooth loss by leaving healthy gum tissue in place around the teeth and by stimulating bone growth, which can help damaged teeth reattach to the bone. The LANAP® procedure also poses a low risk of infections and other complications, since it is minimally invasive. By effectively treating gum disease, the procedure may even help patients enjoy better general health. People with periodontal disease have a higher incidence of serious health conditions ranging from stroke to pancreatic cancer. Patients who visit Dr. Amato for gum disease treatment can lower their risk of developing these conditions. Dr. Amato encourages his Bridgeport patients and residents in the surrounding towns of Monroe, Shelton, Trumbull, Ansonia and Derby, CT to recognize the signs of gum disease. Common indicators include swelling, bleeding, redness, or tenderness of the gums. Victims of gum disease may also notice changes in tooth positioning, gum recession, or persistent bad breath. People who notice these signs should schedule an appointment with Connecticut periodontist, Dr. Amato by calling his office. Patients are also welcome to visit Dr. Amato’s website for more information on gum disease symptoms and treatment options, at http://www.connecticutperiodontist.com. Dr. Richard Amato is a Periodontist and Dental Implant Specialist who provides the most advanced technology for his patients in Monroe, Connecticut. He has placed thousands of dental implants since 1989. Dr. Amato graduated first in his class with a DDS degree from Stony Brook University. Dr. Amato then completed a full time multi-year specialty residency and received his Certificate of Proficiency in Periodontics from Eastman Dental Center at the University of Rochester. He is part of one percent of dental professionals in the USA providing the LANAP® FDA cleared laser procedure for gum disease treatment. Dr. Amato is the first and most experienced dentist to provide LANAP® therapy in Fairfield County Connecticut. 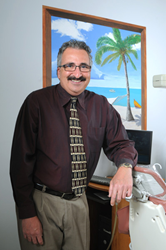 To learn more about Dr. Amato and his dental services, visit his website at http://www.connecticutperiodontist.com and call (203) 712-0917.